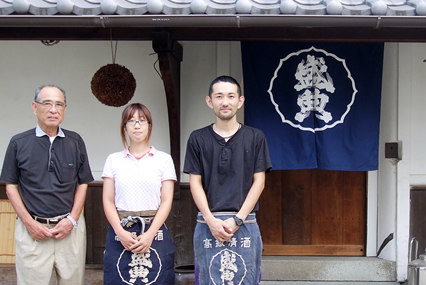 Turning over a new leaf, the homemade sake brewed by two generations, a parent and child, aims to be a famous liquor which represents Kakogawa. We heard that until recently, you have made sake as a subcontractor with a major company. Aoi Tanihara and the eldest son, Yoichi. Our company was established in the seventh year of the Meiji era (1874), currently I am the fifth generation and my son is the sixth. 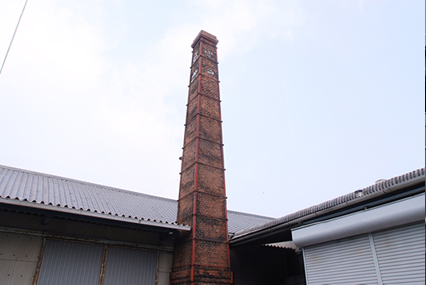 Over these almost 50 years, we were producing a large amount of sake as a subcontractor of a major manufacturer. However beers and wines were much more popular and the amount of Japanese sake being consumed had decreased, so the manufacturer also reduced the scale of production and the contract with our company finished. For a moment I thought of giving up our business, but together with my son we turned over a new leaf and started making sake local to Kakogawa in 2010. Now, it seems we are starting to be recognized little by little as Kakogawa's sake store. When we reembarked on our business, we traded in our machines for ones that produce a small amount. The scale is about one tenth of what it was before, and the amount produced is about one one-hundredth. And with that, we will try our best to get everyone to say "there is good sake in Kakogawa." 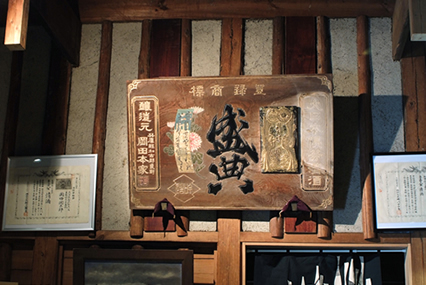 Please teach us about the brand which represents the brewary, "Seiten(Ceremony)." "Grand Ceremony," that has continued since the Meiji period. 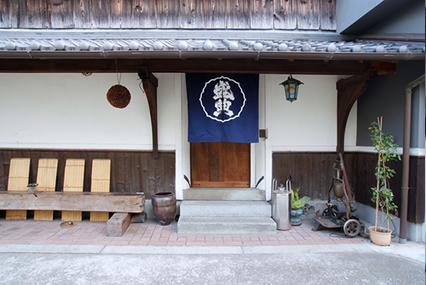 It is the brand of sake which we made before that time where we were producing large amounts of sake. Our company was established in the Meiji era, but the name originates as a salute to the coronation ceremony of the Meiji emperor, "Honorable Ceremony." The label also harks back to those times, we are using an old fashioned Japanese sake label. Now our company is cultivating brews such as our Pure Rice brew which uses Gohyakumangoku sake-rice, and our Very Special brew which is brewed with Yamadanishiki short grain sake-rice. People are saying "using the underground water from Kakogawa, it's a crispy and dry moderate sake with a pleasant sweet and sour taste." Customers have asked us "what kind of cooking does this fit with?" At that time, we give advice along the lines of "it's delicious when you drink it cold," but we don't dare to say anything specifically. That is because we think it's best for the customer to enjoy their own free combinations. Because the customer doesn't have any preconceptions, we have actually been taught ways to drink it from them, without thinking of anything ourselves. By that meaning we think our sake has a magnanimous, broad flavor. The amount we are brewing is small, so unfortunately we sometimes make our customers wait for it, but every year there are people looking forward to it, so we are very happy about that. It seems you have started cultivating sake-rice on your own, isn't that right? The indigo sign curtain reflects well off the beautiful white plaster wall. Now, we are trying to raise our brand awareness as the local sake of Kakogawa. As a local sake, we think it's very interesting to brew sake with rice collected from the soil of the local land. While receiving advice from the Harima sake brewers association, we are taking on the challenge of making our own sake-rice. This year we cultivated Gohyakumangoku short grain sake-rice. It's also fun to brew with that rice, isn't it. We are also thinking of challenging something which uses flower yeast. Everyone from the Harima sake brewers association are very knowledgeable, and for whatever thing we think of trying, we receive various advice and information from them, so it's reassuring. As for us, we also plan to borrow their knowledge and study as hard as we can. Please tell us about your goals from now on. Once, their were many sake brewaries in Kakogawa. But now we are the only one. 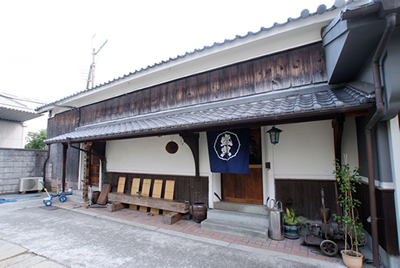 When our contract with the major manufacturer finished we also could have given up the business, but we wondered if it was acceptable for the last sake brewer in Kakogawa to vanish. So we chose to start from square one. From here on, we plan to increase our production amount little by little. And the thought that we want all the locals take away "Kakogawa's delicious sake" as a souvenir more and more, that thought doesn't change at all. Liquor which I want to drink in the summer that is secondary fermentation in the bottle of pure rice sake of popularity, was trapped in the bottle carbon dioxide natural. Liquor with liquor rice that was grown in-house "Gohyakumangoku". 35% to polished Yamada Nishiki Mezzanine, aged over 40 days or more. Enjoy the scent of large sake only.